So I was perusing Autoblog Green tonight and they had a very cool article. Link here. 1) The Prius could use the attention (though we can all agree there are similar and more affordable hybrids out there). 2) There is a link to the student’s web page, which gives a class by class presentation of how the video was made, which is good for both film students and 3-D design students. It’s also very cool to just look at. 3) We should all be reading Autoblog Green. 4) We should pay close attention to things coming from Art/Design Colleges and Conservatories. There is some very neat stuff going on in that world. In the ongoing series of I Go To Film School So You Don’t Have To, I outline the basics of an introduction to filmmaking class (it’s basically film school without the ‘film’ or the ‘school’). Today: editing. I’ll reiterate what I said last week: I don’t know what software you’re using to edit or what sort of equipment you have, so I’ll mostly leave the technical stuff to you. If you don’t know how to do something, read the manual (or you can ask a question in the comments here). So the next few steps will be quite vague, and then we’ll be talking about theory. 1) Get your footage onto your computer – This is called capturing. It’s best to capture video in individual clips rather than dumping it into your computer as one long file. This saves hard drive space and allows your software to work faster. Some software splits apart clips automatically, and with some software you will have to do this manually. This part takes awhile and you don’t really need to do anything other than review the footage as it comes in, so now would be a good time to eat that sandwich. Clip bin – This is where all your master clips (see below) are kept in a long list. The more you capture, the longer this list gets. This is why good naming habits are important. If you have 54 clips named ‘untitled’ you might as well get it over with now and go throw yourself off a bridge. Master clip – A clip you captured from your tape. This is most likely not something you want to plop directly into your movie without trimming first, because it probably has junk on the beginning and end, actors forgetting their lines, and that damn dog that kept barking. Plus, it’s just plain boring to stick with one angle all the way through. Subclip – A clip defined within a master clip. In other words, you mark a time segment within the master clip that you want to use in your project because it doesn’t contain any junk or mistakes or barking. Timeline – Where you put your subclips and arrange them in a coherent order. This is the most important piece of your work area because it is here that you will shape your project, finesse it, and eventually get frustrated and quit. But then you will come back, days or weeks or months or years or decades or (occasionally) centuries later, and you will finish it because otherwise it will JUST KEEP BUGGING YOU. Playhead – This is something in the timeline. It’s a little vertical line that tells you what frame you are currently looking at. If you hit play it will move steadily forward. You can also click and drag it to anywhere on the timeline at any speed, and you will see the resultant frames played back. This is called scrubbing (there’s no reason to know that, except to act all smug and superior in front of your friends and relatives). 2) Play with it – remember: it’s alright to make mistakes. This is called nondestructive editing, and experimentation is the best way to work. Digital editing software is built for something called nonlinear editing. This means that you can go back and change things without erasing all subsequent edits, which is something that you would have to do if it were 1989 and you were doing a linear, tape-to-tape edit. With nonlinear editing, you can pick up clips and move them around on the timeline. The other point (I don’t know what it’s called) – defines where in the timeline your clip begins playing. There’s actually a fourth point that defines where in the timeline your clip STOPS playing, but that is usually set automatically by your software and we don’t have to worry about it for now. Now, you don’t necessarily need to know that stuff, but it helps. You’re probably already doing three-point editing without realizing it, and there are many different ways to edit. One of the most popular techniques for beginners is to drop the whole master clip into the timeline and then trim it down from there. You can do this by grabbing the beginning or end of the clip and dragging it in to the point where you want the clip to actually start and stop (this is called rolling the edits), or you can use the ubiquitous cutting tool. In Final Cut, it’s called the razor. In Premiere, it’s called the blade. In Avid, it’s that little picture that looks sort of like a fish next to all those other pictures that look sort of like other fish. In iMovie, you “split clip at playhead.” In Windows movie maker, you curl up into a fetal position and weep for several hours and then go out and walk the dog. However you do it, the cutting tool lets you bisect any clip in the timeline. You usually then delete one of the pieces because it contains one of your actors making a Freudian slip that is, although spectacular, out of place in your film. Guess what? That’s three-point editing, too! It’s ALL three-pont editing! You can’t escape! HAHAHAHAHA! Sorry. All I’m saying is that if you stop thinking about it and just edit, these things tend to work themselves out on their own. WITH NONDESTRUCTIVE EDITING, NOTHING IS REAL. That clip bin up there? That’s imaginary. So is the timeline. It doesn’t exist. And not just in the sense that nothing on your computer really exists; these things actually aren’t real. “Wait a minute!” you cry in outrage (Go ahead, do it. It relieves stress. ), “Why did I just spend two hours learning how to use something that isn’t real?” The answer, of course, is that it beats doing real work. But all is not lost! Because your computer is watching you. Yes, your computer has been spying on you as you do all these imaginary things, and even as it contemplates to itself how silly you are, it writes down every change you make. And every time you ask for something that isn’t actually there, it goes and finds something that vaguely resembles what you’re looking for and shows it to you, under the theory that it’s better to appease you than suffer your insane (and possibly dangerous) ramblings. When you capture all your master clips, they are saved as video files in a folder somewhere on your hard drive. When you bring up a master clip from your bin, your computer finds the file you’re looking for and feeds it to your editing software, which in turn shows it to you. When you make a change in your timeline, your computer writes down that change in a text file so it can remember it later. Here’s the clever bit: when you trim a clip down and put it into the timeline, the original master clip is not affected. Instead, your edits are recorded in this text file, which is essentially a little recipe that explains to the editing software how to take the master clips and turn them into an edited project on-the-fly. ISN’T THAT COOL? OK. So you don’t think it’s cool. I understand. You probably think it’s really goddamn confusing. WELL, YOU’RE IN LUCK! YOU DON’T HAVE TO WORRY ABOUT ALL THAT! Why? Because you live in the imaginary fantasy world of your editing software, which presents you with a nice, safe, tidy ersatz reality that’s much easier to understand. If SÃ¸ren Kierkegaard were alive today he’d probably have a lot to say about that, but none of it would be very interesting. Yes, the world of editing software is deep and confusing. This is because software engineers, like the video engineers from last week, hate you. Learn to live with the pain. The most important thing to remember here is that the best way to learn to edit is by editing. Don’t be afraid to play around, you’re not going to break anything. So you know how to edit. that’s all well and good, but there’s a difference between editing and editing well. I’m not going to be pedantic about what sort of editing is good and what sort isn’t; that’s just something you’ll have to figure out on your own. Instead, I’m going to talk about a few of the prevailing techniques and styles of editing. The first one is the simplest: don’t edit. Basically, you shoot everything from one camera angle and never cut to anything, just run all the way through from beginning to end. Some people, like Hitchcock, can do this well. Most people wind up with something that is incredibly dull. This is maybe worth trying at some point, but not only is it unlikely to be very interesting, it is much more difficult to shoot. Another option is cutting on the action. Remember last week when I had you watch a well-edited scene from a movie and said there were probably twice as many edits in it as you would expect? That’s because the editor took the time to cut from one angle to another when action is going on in the frame, and matching the action between the angles so that it flows smoothly. This creates what is essentially an invisible edit – one the audience doesn’t notice because they’re focused on the motion. It takes practice to get this right, but once you do it can work miracles. If there’s one thing I can’t stand it’s UNMOTIVATED EDITING: edits that happen for no apparent reason and just sit there, silently and belligerently daring the audience to justify or explain their existence. JUST FREAKIN’ DON’T CUT TO ANOTHER ANGLE UNLESS YOU HAVE A GOOD REASON. OK? So what are good reasons for cutting? Well, if you want to show a character’s reaction in close-up, that’s a good reason. If you want to establish the scene or give an overview of the action occurring in the scene, THAT’S a good reason. If you want to use a cutaway of the main character’s left foot in order to expose to the audience his discouragement with the traditional two-party political structure in contemporary American politics, even THAT is a good reason, if you can get the audience to swallow it. If you want to cover up a mistakeâ€¦ that’s not a good reason. That mistake shouldn’t be there in the first place. Find a take that doesn’t have that mistake in it, or use a different angle. If you MUST cover up an edit such as that, at least cut to something relevant rather than dropping in a meaningless cutaway. Mmkay? Editing software automatically links picture with sound. That’s good enough for now. Just pretty much let sound do its own thing for now and be moderately satisfied with the results. In future lessons we’ll be talking about sound and the myriad ways it is going to ruin your life. So you’ve got that to look forward to. …And that’s really about it for this week. Your assignment for next week is to edit your movie. I’ve gotten a lot of curious inquiries about what is taught in film school, so I’ve decided to inaugurate a new regular feature: I Go To Film School So You Don’t Have To; basically film school without the schoolâ€¦ or the film, to be honest. We’ll see how it goes. Hello, class. This is a basic introductory seminar on film and film production. Today we’ll be covering the theory of sequencing, the technology of film and video, and the basics of using a video camera. Here’s an exercise to start out with: pop in that DVD of a well-edited movie. Find a 2-3 minute scene that doesn’t use long, lingering takes. Watch it all the way through, and keep track of the angles used. Now here’s a question: how many cuts are in the scene? My guess is about twice as many as you expect, somewhere from 50-80 cuts in a 2-3 minute scene. The reason that you don’t notice as many cuts is that many of them occur on action. We’ll come back to this in a bit. Go back to the beginning of the scene, and break down the angles use. Don’t just look at the usual long/medium/close aspects of the shots, but what’s in each shot. How is it composed? Is the camera placed high up in the air or low to the ground? Is the camera moving? How is it moving? These are just a few of the things you will need to consider in making a film of your own. But how exactly is a film made? Let’s start with the technology. Most movies—real movies, that is—are shot on film. The two most popular film formats are 35-millimeter (this is what is used on most big-budget films and also what you find in any point-and-shoot still camera) and 16-millimeter (this is used by film students because it’s half as wide and so not only is the film cheaper, so are the cameras). If you’re really desperate you can go down to 8-millimeter. Film cameras work by taking a freakin’ LOT of pictures and laying them out vertically on a long strip of film. The standard speed for movie cameras is 24 pictures—or frames—per second. The camera’s shutter opens to expose the film, then closes. Then a mechanical claw grabs the sprocket hole on the edge of the film and pulls it down to bring the next frame into registration. Then the shutter opens again. This happens twenty-four times every second. I’m not sure if you grasp how truly fast this is. Remember that the film can’t just move through the camera at a steady speed; it has to be standing ABSOLUTELY STILL when the shutter opens. The really stunning thing is that some 16mm cameras are capable of running at up to 500 frames per second! YOU try doing that! I bet you can’t! Along the left, you can see the sprocket holes used to pull down and register the film. On 16mm film, there is one sprocket hole (perf) per frame. The dark rectangles are the image area, where a picture is recorded. When the film is finished and ready for projection, the same system is used, except in reverse. Instead of light entering through the lens, it exits through the lens and is shone onto a screen. Because film is translucent, the picture on the film is enlarged and plays like motion on the screen. Film is also projected at 24 frames per second, in order for motion to be accurately reproduced. HERE’S THE IMPORTANT BIT: Even though you see smooth motion on the screen when you go to the movies, you are actually in complete darkness HALF THE TIME. What a rip-off! So why didn’t you notice? Persistence of vision. The real explanation has to do with the rods and cones in your eye and how your optic nerve transmits information to your brain and something called the opponent-process theory. All you really need to know is that when your eyes suddenly jump from a brightly illuminated scene into darkness, they are left with a distinct afterimage, and THAT is why movies don’t look all flickery when they’re projected, even though they are. OK, you got all that? Good, now forget it. Because you, meaningless peon, will be shooting on video. It’s sort of the same idea as film, but with a few key differences. They can best be understood by taking a look at a VHS tape. Remember those? I’m sure you’ve got one lying around somewhere. Break it open. Just break it open. Hit it with a hammer or kick it real hard, just get that tape out of there. Now that the tape has been liberated from the cassette, you can take a look at it. The first thing you’ll notice is that, unlike film, there are no sprocket holes. This is because tape recorders use digital, rather than mechanical, devices to register the tape as it goes through the camera. The second thing you’ll notice is that you can’t see a picture on the tape. Well, that isn’t entirely true. The picture is still there, but because it is never directly projected, the tape contains a black backing that blocks interference. If you take that tape and hold it up to a bright light, you should be able to see a very faint picture of each frame. OK. Just kidding. But I got you, didn’t I? Admit it. Video cameras work by laying down a magnetic signal onto the tape, so you can’t see it with your naked eye. But they do still work by taking a picture of each frame, just at a different speed. Video cameras run at a frame rate of 29.97 frames per second, or 59.94 fields per second (don’t worry about fields for now, we’ll talk about that more when we get into editing). This is because electrical engineers hate you. Deal with it. That’s really all you need to know about video. I mean, we could get technical about it but there’s really no need. It just works. Now it’s time to break out those cameras. I don’t know what model of camera you’re using, so if you don’t know how to do any of these things you’ll have to *gasp* read the manual. First, turn your camera on and put in a tape. Remember to take off the lens cap. Familiarize yourself with all the buttons and gizmos and cool effects. You will not be using 90% of these, but it’s somehow comforting to know they’re there, just in case you ever need to superimpose a cheesy “Happy Anniversary” title over a shot of your aunt’s dachshund eating a whole fried chicken. How to fix these features so they go away and never bother you again: Turn them off. This is usually done from some section of the menu. Make sure that date/time stamp goes away, that digital zoom is turned OFF, that focus and exposure are both set to “manual” and that you never EVER go near the digital picture effects. When you focus, zoom all the way in. Zoom back out once you have good, sharp focus. This ensures that your subject stays in focus no matter how large the video is projected. Exposure is tricky. Set exposure by looking in the eyepiece rather than the LCD screen. Set it to what you think looks right, then make it just the slightest bit darker. Try to avoid “blown-out” highlights where all you can see is flat, solid white. The dark, brooding abyss of LP mode: Most cameras support two recording modes: SP (standard play) and LP (Long Play); LP is sometimes referred to as EP, or Extended Play. LP mode works by running the tape through the camera at a slower speed, packing the data more densely onto the tape, and ultimately letting you fit 90 minutes of video on a 60-minute tape. Great deal! Right? By running the tape through the camera at a slower speed and packing the data more tightly, you open yourself up to the risk of dropouts, tape incompatibility and data errors. These things are like AIDS: they can’t be cured and they ruin your life. But avoiding them is easy: just make sure your camera is set to SP mode. You don’t even have to get tested. Tripods are a good place to start in terms of camera support. They are versatile and offer an array of possible shot angles. Get to know your tripod. Carry it around. Sleep with it. Sing to it. Then attach your camera to it. Again, how you do this varies from tripod to tripod, so it’s best to read the instructions. Then stand the tripod up and fold out the legs. Voilà, as the French would say—you have a camera support. Practice panning (turning the camera from side to side) and tilting (tipping the camera up and down) using the handle. There are most likely control knobs on your tripod to set how much force is required to do this. Fiddle with them. You want to make these movements as smooth as possible. This takes practice. The best way to practice is to make a movie. Camera placement – high or low? Medium shot, wide shot, close-up? How do the camera angles you choose reflect the action and characters in the scene? Cutaways are shots that show close-ups of relevant non-action scene elements. For example, of someone is dialing a phone, you might want to get a close-up of the phone. Coverage refers to the number of angles you have on any given moment in the scene. Be sure to get plenty of coverage, so you have plenty of choices in editing. Locations – Don’t just shoot this in your living room. Find a relevant location that meshes with the aesthetic you are trying to convey. Safety precautions – You wouldn’t want to get an amazing shot that you can’t use because the computer can’t capture it. So before you start shooting, shoot 30 seconds of nothing on the beginning of the tape. This ensures that the computer will be able to capture every frame of video that you shoot. Timecode – Digital tapes use something called timecode to keep track of where clips are located on a tape. This is a great system, provided that you don’t get a dreaded timecode break. This occurs when there is an empty space on the tape in between two recorded shots. When this happens, the camera will start up the timecode from 0, which will just really confuse the hell out of your computer. These breaks usually occur when you rewind the tape to review something you just shot and you let the tape run past the last frame. The best way to avoid the problem is to just not review your footage until you’re all done shooting. OK, I think that does it for today. We’ll be editing your assignment next week, so you’ll need access to a computer with video editing software, whether that be Windows Movie Maker or Final Cut Pro. You’ll also need the FireWire cable that hooks your camera up to your computer. You should practice a bit with this software, because since I don’t know what software you’ll be using I’ll be speaking in vague generalities about the theory and practice of editing, rather than tailoring my instructions to a specific software package. If you have any questions just leave them in the comments section of this post. Well, ladies and gentlemen, it’s been a month away from Minneapolis and school and I am feeling refreshed, if a little reluctant to head back. I am right now sitting in seat 13F of United flight 364 nonstop to Minneapolis/St. Paul International Airport (MSP). I am watching the sun set out my window, over an infinite sea of snow clouds. When asked what I accomplished in the past 30 days, I can proudly respond, “Virtually nothing.” I have always worried that I am incapable of taking time off, and that if I never take any time off I’ll burn out and stop being able to think creatively. But this month I took my sweet time in doing things and was mostly able to stop thinking about delivery dates and production schedules. This is my kind of flight. Right before we took off, a flight attendant announced that we’d be getting into Minneapolis “around 6:15, or something like that.” Now the pilot is reading off football scores. Not that I follow football, but it’s the thought that counts. As far as Terminal Philosophy goes, we got most (but not all) of the pickups we needed, and a fair deal of ADR. The good news is that Parker got a shotgun mic for Chrismas and should be able to record ADR in Colorado and then upload it for me to integrate in the master timeline that I am working on in Minnesota. Ain’t technology grand? The major pickup we got was an entire missing scene. Every production has a cursed scene. In Wholesale Souls it was Scene 13, a moniker which still strikes fear into the hearts of those who worked on the film. In Terminal Philosophy, it was the scene In Which Leo Meets the Grim Reaper. I’ll be posting a thorough article on that scene and all the problems we had in a day or two, but for now suffice it to say that the scene is in the can, that in the scene I make my “real” acting debut, and that despite all my nerves and all the difficulty we went through, I am quite ecstatically pleased with the footage we got. 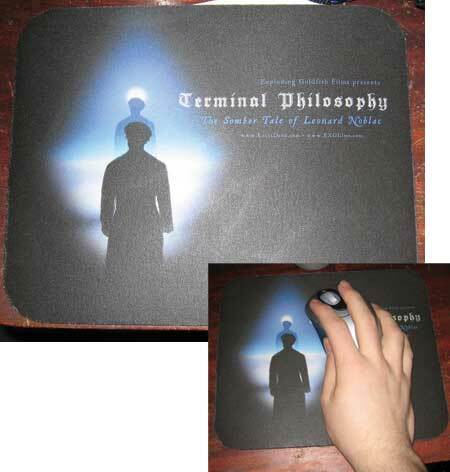 Now the big news: The first cut of Terminal Philosophy is almost done. That’s right, we have (with a few minor holes) everything up from the beginning of the movie through Leo’s entrance into Hell edited and pieced together. Of course, now I’m going to be busy with school (including my first ever real film class), so progress will slow dramatically in the ensuing months. Anyway, that’s what’s been going on with me. I had this really weird dream last night that our country used to be a place that despised diversity, that didn't know the meaning of the word. It was a crazy fever dream where most people didn't matter. And then the world was changed by the arrival of the greatest speechmaker the world has ever seen. Martin Luther King, Jr. Day is the one holiday that I can celebrate wholeheartedly. It is the one holiday with a social conscience, and it is the one holiday that is forward-looking rather than backward-thinking. The upper class in the past couple decades have come to endorse the idea of 'tolerance.' We urge our educators to teach our children tolerance, we try to lead our existence with an outlook of tolerance for other people. I do not like the idea of tolerance. The word comes from a late Middle English term denoting the action of bearing hardship. It implies that there is hardship to be born. That is wrong. This is an unfinished post. It is unfinished because I am listening to speeches made by a man who was the voice of an entire nation, and it's taking the wind out of my sails. We have no such voice today. It is unfinished because so is the struggle for equality and social justice. What is it about little films—personal dramas and the like—that bores me to tears? What is it about period pieces and early twentieth-century Americana that leaves a bad taste in my mouth? And what is it about Sweet Land—a small personal dramatic comedy set in post-World War I Minnesota—that manages to overcome these shortcomings to charm and impress me? Quiet, dignified humor and gorgeous cinematography certainly help, But I think what really won me over about this film was that it knows what it is—a love story about two people who lived a long time ago—and it doesn't try to overextend itself. It doesn't have delusions of grandeur. In the spirit of full disclosure I should point out here that Ali Selim, who directed Sweet Land, is a professor at MCAD. I've met and spoken to him briefly. He is a soft-spoken man with tired eyes. He looks like a director. I submit to you that although this may be seen as a conflict of interest, this point of intersection with my own life invited me to cast an even more critical eye over the film, looking for mistakes I wouldn't have made, had I been in Selim's position. This is his first feature film, and I noticed a few mistakes similar to those I made in Wholesale Souls. Most notably, the beginning is jumpy, flitting in between three different time periods in what at first seems to be an unnecessary complication of things. However, by the end of the film, all is tied together and all three time periods resolve nicely. Selim has, until now, worked primarily as a director of commercials. This shows very clearly in his film, and in no bad way. Successful commercials employ extremely efficient storytelling. They say only what they mean to say, and they can make a tube of toothpaste into the most exciting thing you have ever seen. Had Sweet Land been directed by a more standard-fare independent filmmaker, it would have been incredibly dull, but Selim is able to move the story along without rushing it or compromising its subject. One of the most interesting and ultimately rewarding directorial choices Selim makes is to leave large portions of the film in untranslated German as spoken by one of the main characters, a German immigrant. No lapsing into English, no overdubbing, no subtitles. Nothing. A director of weaker constitution might have given up on such a concept early into the film, but the fact that it is consistent throughout is what makes it work. Of course, for this to work requires a spot-on performance, and Elizabeth Reaser delivers it and more. She gives the entire movie an energetic personality, something lacking from most period pieces. Sweet Land is charming and succinct—poetic in its simplicity, exuding the same quiet confidence as the community it depicts. I am tremendously proud that an MCAD faculty member has produced a work of this caliber. A NOTE ON WHERE TO WATCH: Sweet Land closed in Colorado last week and the film is at this point in an extremely limited theatrical release, playing in Landmark theaters around the country through the end of February. 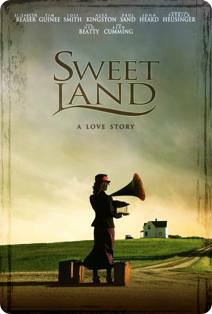 Check www.sweetlandmovie.com to see if you've been blessed with an upcoming showing in your neighborhood. Otherwise, wait for the DVD. The film has been getting some much-deserved attention (two Independent Spirit nominations and countless good reviews), and so it seems likely that when the DVD comes out (probably sometime this spring) it will wind up in a Blockbuster near you. Or you can do like I plan to and just buy the DVD. It's absolutely worth it. I’ve mentioned before that I get a lot of spam in the comments on this blog, but luckily due to filters very little gets through (and I’ve only had one false positive in a year, thankyouverymuch). But I still have to check to see what got caught in my spam filter every couple days to make sure nothing important got blocked, so I have to at least skim all the messages. There are three varieties of spam: The kind that is about 2000 words long and contains only links, the kind that unabashedly advertises what it is selling, and the kind that tries to sneak under the radar by including ostensibly relevant text with a single link to the site it’s pushing. The latter is the most interesting, because I find it entertaining to watch trends in the sort of text they contain. “I’ve just been letting everything pass me by lately. Maybe tomorrow. Today was a complete loss, but that’s how it is. Eh. Oh well. I’ve just been staying at home doing nothing, but pfft. Today was a total loss, but oh well. I’ve pretty much been doing nothing worth mentioning. Of course, this is nothing compared to the time I got literally thousands of e-mail spams from characters of Greek mythology. For all those who are interested in being extras, “World Peace, Ltd. Will be filming TOMORROW. The planned time of gathering is 11am, I think we should meet at Old Town Square. I will need at least 8 extras for the film to turn out as planned. Please wear drab colors, no greens or bright blues, nor reds or yellows. Brown, Grey, Tan, Denim and black will all work. Try to make the clothing as disgruntled as possible, but be sure to stay warm. The role of the Salesman will be played by Sean Cummings. I will assign the extras on a first come, first serve basis. Also, if anybody could bring an aluminum trashcan, that would be most helpful. I’ve had trouble trying to find one. PLEASE call me at 231-3293 if you can make it. You know that nothing in your life has changed when your writing a script for a film, you look up at your clock, it says “12:03 AM 01/01/07,” and you realize that you made no resolution, or even noticed when the new year started. You say something along the lines of “Oh! Look! It’s the New Year…oh well.” and you continue to work on your script. This moment proves that your apathy towards normal life will, in fact, help you in a career in films.